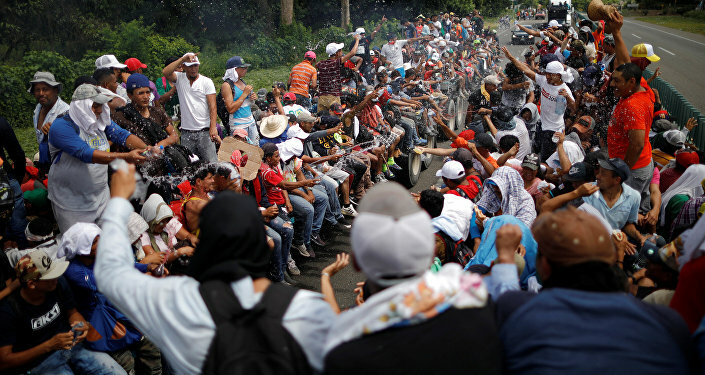 MEXICO CITY (Sputnik) - Migrants traveling in a caravan through Mexico toward the United States are considering the offer by Mexican President Andres Manuel Lopez Obrador to stay in the country and join the Mexican labor force, according to the head of the caravan, Bartolo Fuentes. "Mainly because there are a lot of peasants among us. They can plant and harvest crops, there are people who are used to hard work and could earn good money in Mexico," Fuentes said, as cited by the Excelsior portal, after the meeting with lawmakers from Obrador's Morena party. The Mexican president, who has pledged to help the migrants and possibly grant them working visas, is expected to meet representatives of the caravan on Thursday. The caravan set out from Honduras in the direction of Mexico and the United States on October 13 in the hope of obtaining asylum. According to UN estimates, the caravan includes more than 7,000 migrants. However, Mexican authorities have said that the caravan marching through its territory included around 3,600 migrants. US President Donald Trump is deploying 5,000 military personnel to the US-Mexico border as the migrant caravan moves toward the area, but has said he could increase the number of troops to 15,000.